A. Regular carpet cleaning has a lot of benefits for Centerville homeowners. Carpets tend to get dirty so gradually that we don’t really notice how filthy they have become, and thoroughly cleaning a carpet can get it back to looking new again. This improved appearance can really brighten up your home. Carpets also trap a large amount of dirt, dust, pet hair, and other contaminants that get kicked up into the air as people walk on the carpets. As a result, cleaning your carpets of these contaminants leads to greatly improved air quality in your home. A. 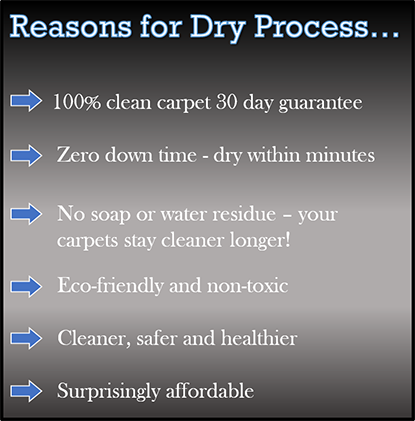 Our exclusive 6-step process will leave your carpets thoroughly clean, immediately dry and ready to use. Our process is recommended by over 150 carpet manufacturers and over 100 fiber manufacturers as well as most padding manufacturers. Our all-inclusive service comes with no upcharges, no add-ons and no surprises. A. As much as we love our furry family members, they can really do a number on carpeting. If you have been scrubbing at a pet stain, unsuccessfully trying to remove the odor, then you should call Dry Advantage Organic Carpet Cleaning. A thorough, professional cleaning is all you need to get your carpets smelling fresh again.